A team consisting of FOUR PAWS, Poznan Zoo and vets took the bears away from a mini-zoo in Braniewo in northern Poland, where they had lived for years in confined conditions on a concrete floor and with inadequate medical care. 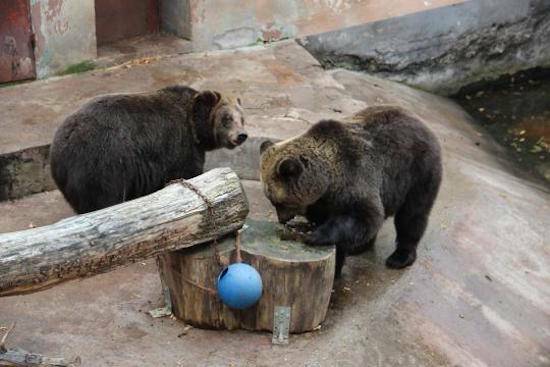 Ewka, 21-year-old brown bear and her 13-year-old daughter Gienia were finally able to travel to their large new enclosure in Poznan Zoo. After a six-hour long journey they arrived there safe and sound. Now the two bears are living in a large outdoor area. The enclosure was built to strict animal welfare criteria and financed with the help of FOUR PAWS. As you can see on their faces, they are more than happy with their new life!